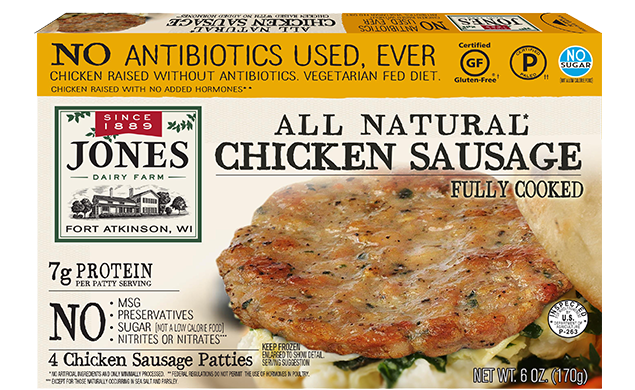 Eat clean with great-tasting, antibiotic- and sugar-free chicken sausage patties from Jones. There's a lot to love about our all-new chicken patties. With all-natural, great-tasting ingredients—like vegetarian fed, hormone-free poultry—there's no need for additives like sugar, MSG, nitrates or artificial flavors. Certified Paleo and Gluten-Free, each serving clean-label sausage delivers 7 grams of protein and just 4 grams of fat. Plus, it's fully cooked and easy to prepare. Find it in the frozen section. Keep frozen. For best flavor use within 30 days. Use thawed product within 7 days. Heat chicken sausage patties on MEDIUM (50% power), using microwave-safe plate lined with paper towel, for times shown, or until heated through. Place chicken sausage patties in preheated skillet over medium heat for times shown, or until heated through. Turn occasionally for even heating. * Percentages based upon a 2,000 calorie diet. Your daily values may be higher or lower depending on your calorie needs. We want you to love every Jones product that you buy. If you’re not completely satisfied, just tell us why and we’ll give you a full refund.